When she’s not out representing Every Australian Counts at Parliament or jetting across the world to speak at the World Federation for DeafBlind Conference, Carleeta is an avid gardener at her home in Sydney. Growing everything from native flowers to shallots, Carleeta can often be found out in garden and doing the things she loves. It’s her goal to make sure all deafblind people have those same opportunities. Every Australian Counts spent the day with Carleeta so more people could have the chance to hear from her about her passion for change and determination to make sure the NDIS works for all people with disability – but especially those who are deafblind. Check out the video below, or read on to find out more. Carleeta believes that one of the most critical things for the deafblind community is access to communication. While there are often many things standing in the way, Carleeta says there are also many ways to ensure deafblind people can connect with their friends, family and community. Carleeta wants to ensure all deafblind people have the same opportunities that she does to communicate and stay connected with the people around her. Carleeta enjoys reading the news on her phone or computer using her braille display, surfs the internet and keeps in touch with her friends and family via email. She wants to make sure others have those same opportunities, so dedicates her time teaching braille to others in the deafblind community. Other than communication, Carleeta says that one of her biggest challenges is going out by herself. Carleeta says she has to tackle many barriers to do simple everyday tasks that other people take for granted – like buying a birthday card for example. She always has to have someone with her to serve as a communication guide. Carleeta points out that while the Australian Government is beginning to provide for deaf-blind people’s needs, there are still a lot supports missing. She says that a lack of communication guides to support deaf-blind people to get outside and do the things they want to do is a continuing problem, and she hopes that the government and NDIA can work together to ensure that there are enough guides for people who really need them. Carleeta also says that it is important that deafblind people and communication guides are given the freedom to work together in the way that works best for both of them. In her experience, sometimes the guidelines of an organisation (and even the NDIS) can be too strict and they don’t recognise that everyone is different. She says that the best way to achieve results is when people with disability and their support workers are able to communicate and work together. As an Every Australian Counts Champion, Carleeta is excited keep the ball rolling when it comes to making sure our leaders fix the NDIS and make sure no one falls through the cracks. It is her goal in 2019 to make sure the NDIS becomes flexible enough to meet everyone’s needs. TITLES: Meet Carleeta. Every Australian Counts Champion. CARLEETA VIA INTERPRETER: It’s now 10:40 [am]. I try not to concentrate on the fact that I am blind. I try to look at the positive side of life. 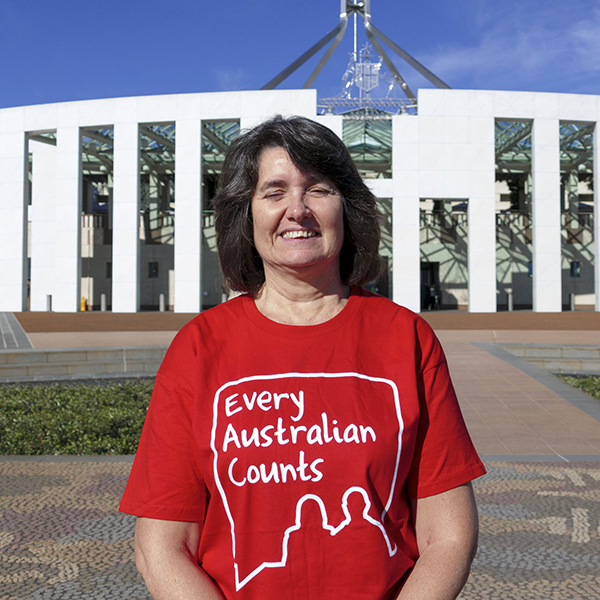 Trudy at CCA had asked me if I was interested in being involved with Every Australian Counts. I gave a presentation there – at the World Federation for Deafblind conference on how I am advocating on Deafblind people’s behalf as being part of Every Australian Counts. It makes me feel very happy to be the representative for Deafblind people within Australia. Yeah it’s certainly, certainly very proud. CARLEETA VIA INTERPRETER: I use my cane to get me from um, and I follow the border so that it will show me where I need to water the garden. They’re shallots. Growing some shallots. I’m teaching Braille with adults who are Deafblind themselves, who have never learned Braille. It’s really important. Otherwise communication is not accessible. When I read the news, I do that via my phone or computer. I also have access to the internet and emails and I always use my braille display. The Australian Government is starting to provide for Deafblind people’s needs, but communication guides to be able to go outside the home are so important. Going out by myself – I can’t do it. It’s not safe for me. So I need somebody who can see because you can’t be the communication guide for me if you can’t see, so that I’m safe. But, I’m extremely grateful to the government for what I’ve got in terms of support for communication guides and interpreters currently. It’s my responsibility as a Deafblind person, as a person as an individual, to teach them what I need and to teach them the right way how to do it. TITLES: Carleeta is one of 7 Every Australian Counts Champions. The Champions are passionate about an NDIS that works for all of us.